R2M Hospitality Group have exceptional food and attentive service at Delicatessen, Cafe 12, Coffee Bar and Hotel Montefiore. 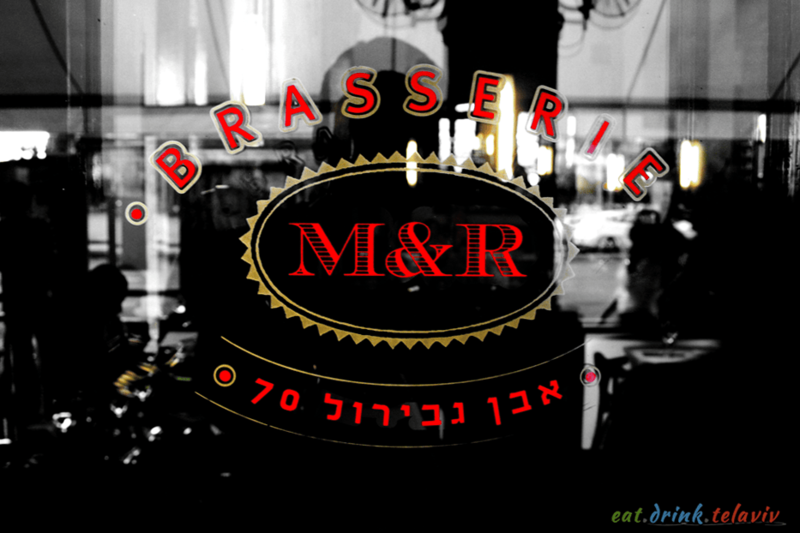 Brasserie, Tel Aviv has a simple yet full menu of classic French dishes including Boeuf Bourguignon (Beef Stew in Burgundy wine), Soupe à l’Oignon Gratinée (French Onion Soup), Steak Tartare (raw ground beef), Moules au Citron (Mussels w Citrus), and Coq au Vin (Chicken stew in wine) to name a few. 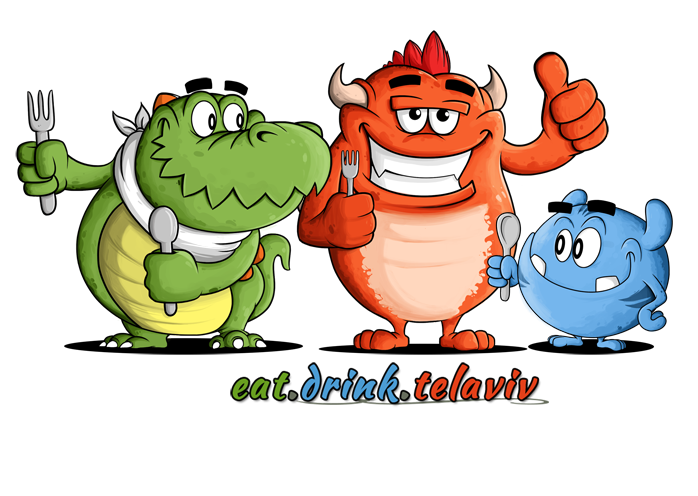 The menu is rounded out by a few Salads options, a few Pasta dishes, a plethora of other French inspired Entrees (appetizers) and Plats Principaux (main dishes) including the oft-mistaken for French but actually Swiss – Cordon Bleu (Veal Schnitzel with ham and cheese). They say you learn something new every day! 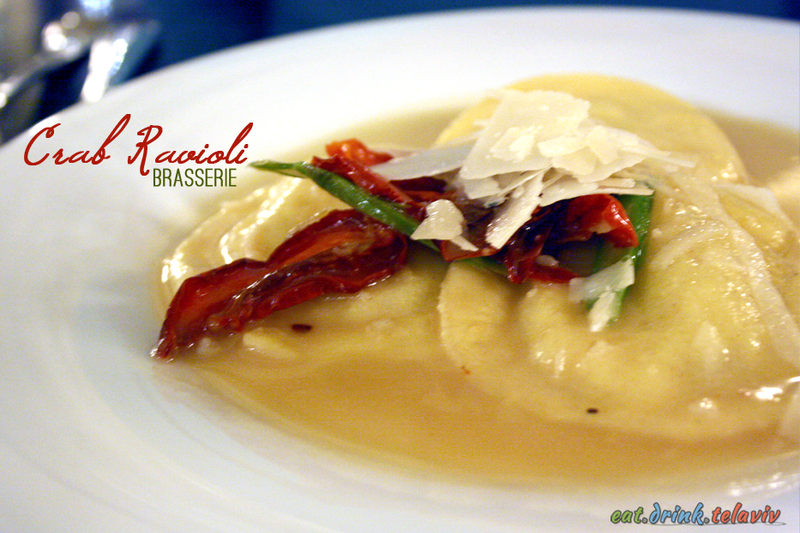 We dined at Brasserie for a birthday celebration, four of us, seated inside in the middle of the restaurant. Soft music – a mixture of light French and easy-listening crooners – think Michael Buble-esque or Frank Sinatra. Maybe Francois Sintareaux. Despite the lively energy emanating from the full restaurant – servers in their white-whites gliding briskly across the room, the businessmen beside us chatting away over chilled Champagne, a table full of young friends laughing – we are so relaxed. A noted peacefulness surrounded us as we settled into place. And yes, we are very excited to finally be at Brasserie. 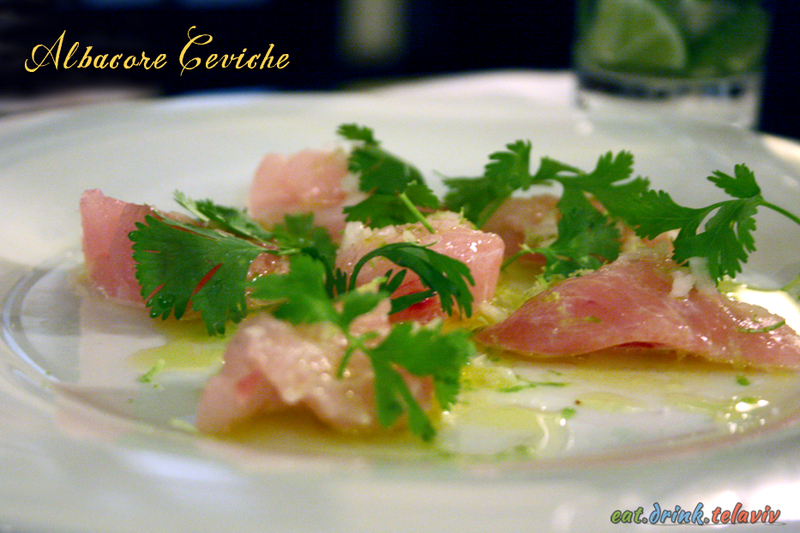 Appetizers ranged from land to sea. 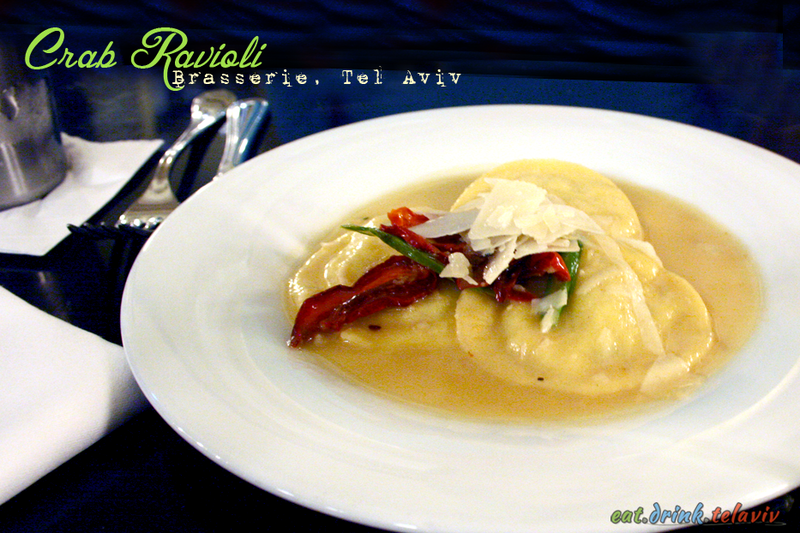 The Crab Ravioli was noted to be delicate and flavourful with a warm delicious butter sauce. 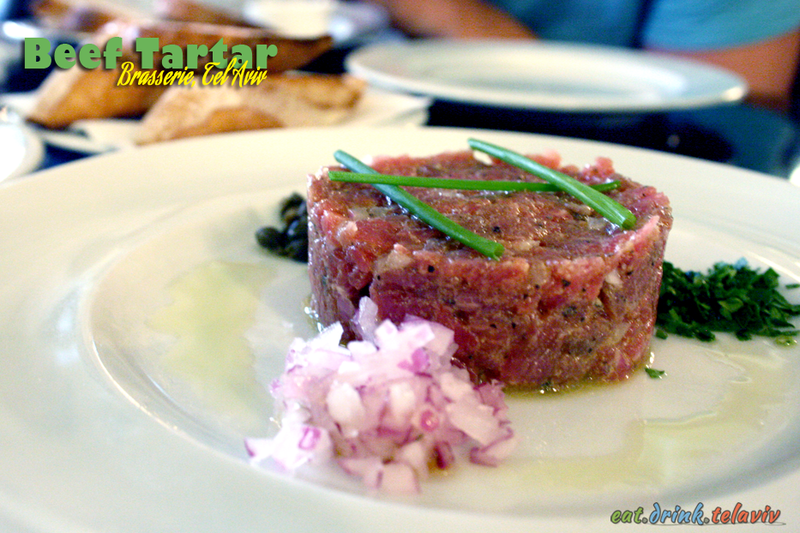 The Albacore Ceviche was fresh and light, but the Steak Tartar was such a treat combining a fresh taste with a lovely texture. 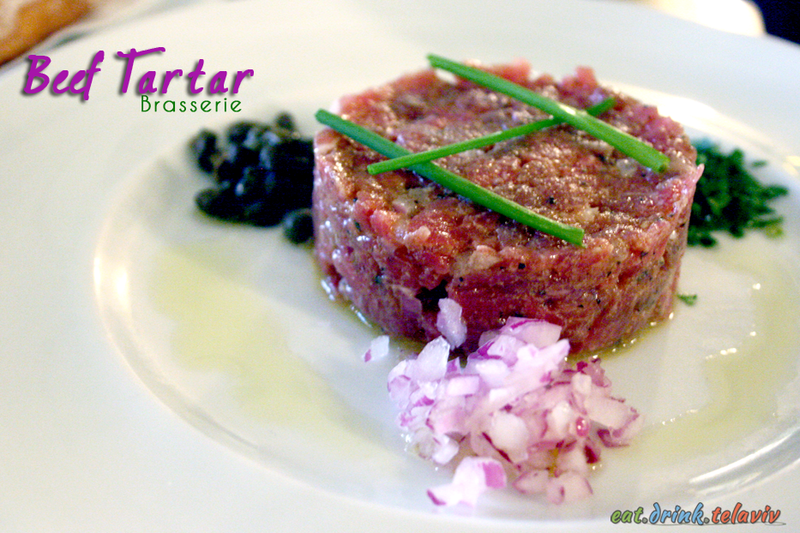 Brasserie is known for their high quality food – and the main dishes delivered for the most part. 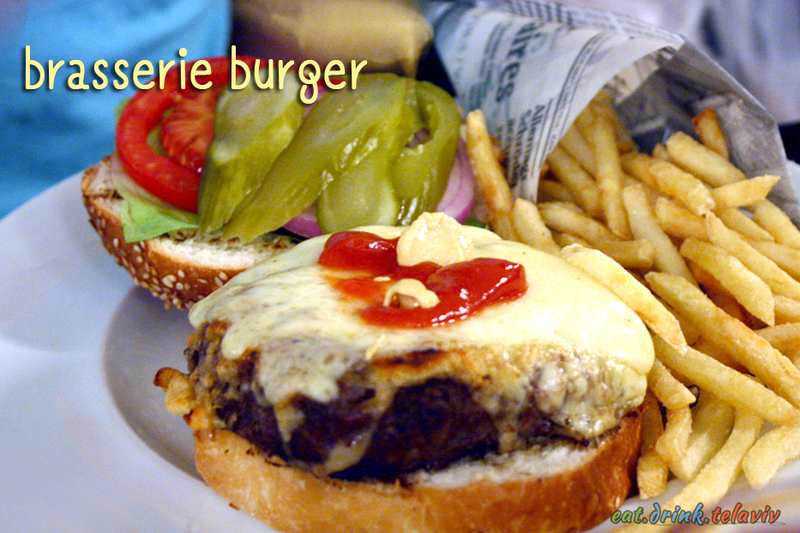 The Hamburger (69NIS) at Brasserie, Tel Aviv has a reputation for one of the “best burger in town.” The Beef Filet was ordered medium but arrived more towards the rare/medium-rare end, but a choice cut of meat – tender and juicy. The Seafood Gnocchi special (82NIS), while obviously expensive for gnocci, was a knockout, tastefully combining the savoury shell fish with the delicate and soft potato “pasta.” The Cordon Bleu (79NIS) was a fantastically fried dish – crispy, crunchy, salty and hearty (or heart-attacky), everything meat, cheese, fat and salt are meant to do is accomplished. However… Brasserie’s Cordon is presented nicely, but a smaller portion in comparison to say Tel Aviv Restaurant Bayern’s Pork/Chicken Schnitzel with ham and gouda cheese (68NIS). If you are a fan of multiple-meats-with-cheese dishes this will satisfy your tastebuds, but I would definitely recommend something more authentically French (the Coq Au Vin for example.) For dessert we had the Creme Brulee, and the Saint Honore w vanilla ice cream and chocolate sauce the latter of which was highly recommended by the server as a favourite, but we all found it a bit disappointing. 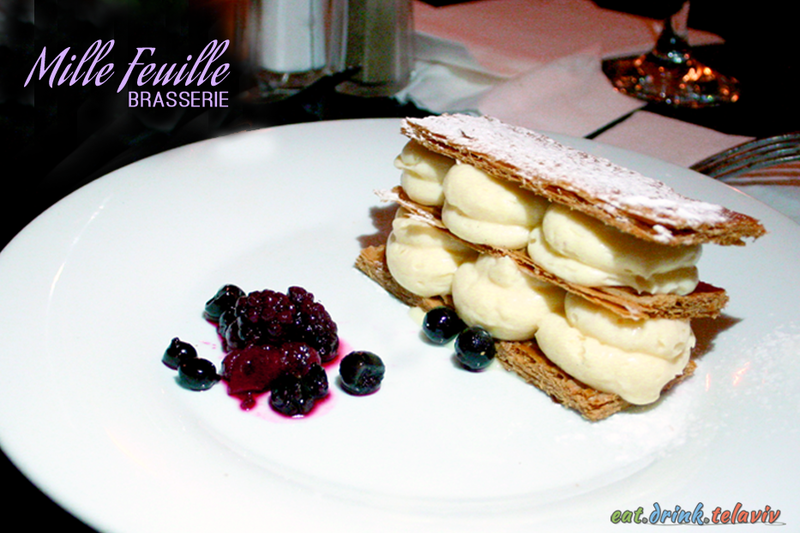 The Mille Feuille was much more satisfying – crunchy, sweet with a light cream. 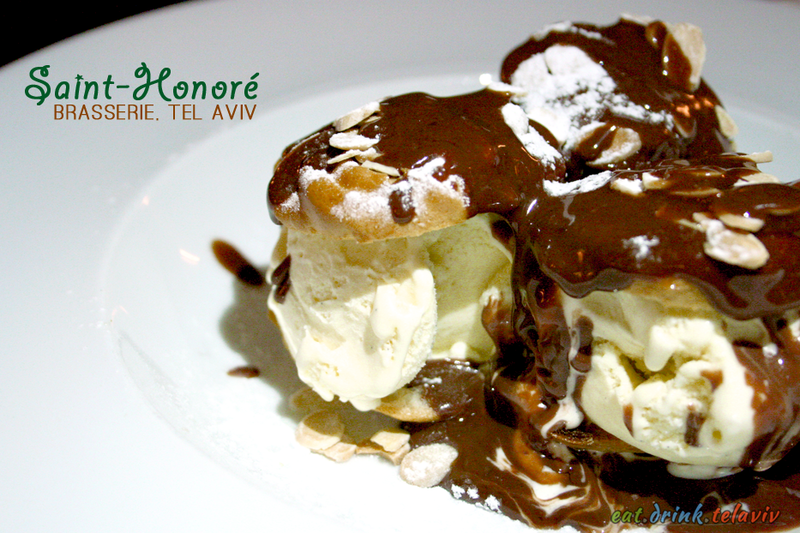 There is plenty to choose from at Brasserie Restaurant Tel Aviv, which makes coming back at any time an easy choice. Whether it’s for a birthday celebration, an anniversary, a special date, or a late night indulgence Brasserie has you covered.